Dear God, Why are there cars named after the jaguar, the cougar, the mustang, the colt, the stingray and the rabbit, but not ONE named for a dog? How often do you see a cougar riding around? We dogs love a nice ride! Would it be so hard to rename the Chrysler Eagle the Chrysler Beagle? More dog letters after the jump. This entry was posted on Friday, May 18th, 2007 at 11:00 am	and is filed under Dogs, National Dog, Cat & Pet Info, Entertainment About Pets. You can follow any responses to this entry through the RSS 2.0 feed. Both comments and pings are currently closed. If YOU come back as a human you’re going to bring smiles, peace, and happiness to the world. You’ll make it a much better place. And I can only hope to be reincarnated as your dog. 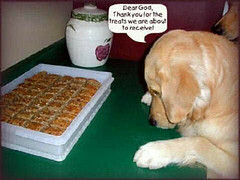 The Book “Pet’s Letters to God” should have been cited. All of these are from the book. ITCHMO ADMIN: Sharon. Thanks for the info. However, we linked to the site that contains the info, which is the legal and common standard procedure.